Between July 10 and 21, the Ontario government will be holding public consultations across the province to get feedback on its proposed improvements to labour laws, employment standards, and its $15 minimum wage plan. See the dates and local opportunities to weigh in here. The corporate lobby is gearing up, particularly around its opposition to the province’s plan to raise the minimum wage from $11.40 today to $14 on January 1, 2018, and to $15 on January 1, 2019. Here is the rebuttal to that corporate opposition—a summary of economists’ take on the issue. There has been lots of corporate fear-mongering around the decision to raise the minimum wage to $15 an hour, but as 53 Canadian economists who signed a letter endorsing the $15 minimum wage say, raising the wage floor makes good economic sense. If you’re working full-time, full-year in Ontario earning $11.40 minimum wage today, you are among the working poor, because that rate of pay doesn’t lift workers above the poverty line. At a minimum, the most basic reward for working should be that it lifts you out of poverty. A $15 minimum wage would do so. The 53 Canadian economists estimate that a $15 minimum wage in 2019 would only be $1 more than the 1977 minimum wage when adjusted for inflation. They also note that minimum wage increases have not kept up with improvements in worker productivity. As CCPA Senior Economist Sheila Block has written, the share of Ontario workers who are in minimum wage jobs more than doubled between 2003 and 2013. 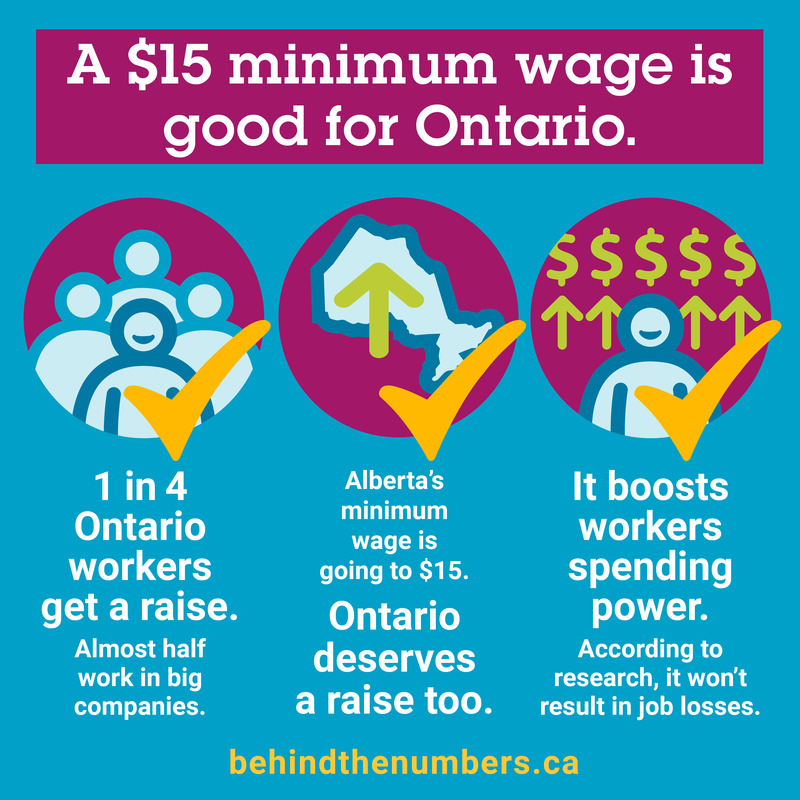 One in four workers make less than $15 an hour in Ontario today—that’s a significant proportion of workers who would get a raise. It all comes down to this: A $15 minimum wage would boost spending power for low-income workers, which is good for the economy. Brennan’s own research with economist Jim Stanford examined minimum wage increases in 10 provinces over 30 years. Their conclusion: There is no consistent connection between a higher minimum wage floor and employment levels in Canada. Next year, Alberta will have a $15 minimum wage. If they can do it, so can we. Vancouver has committed to pay its workers a minimum of $20 an hour—a living wage in that city. The City of Cambridge in Ontario pays its workers the local living wage as its minimum wage floor, which is currently $15.42 an hour. In fact, more than 150 employers across Ontario have voluntarily signed up to pay a living wage, not the $11.40 minimum wage. For all the bluster you’ll hear from the Canadian Federation of Independent Business, a major corporate lobby group, there’s a new employer group called The Better Way Alliance. Pay attention to them, because they’re paying a living wage and are championing the $15 minimum wage. These employers say they’re saving money on sick days, they’re reducing staff turnover, they’re seeing greater employee engagement, and they appreciate the role they play in spurring local economic growth by paying their own workers a higher rate of pay. A final note: Don’t fall for the fear mongering. More than half of minimum wage workers in Ontario have jobs in big companies (those that employ more than 500 people). They deserve a raise and their employers can afford to share their profits with the workers who contribute to the company’s success. This blog is part of a series that examines who will benefit from a proposed move to $15 an hour minimum wage in Ontario. Data on how $15 minimum wage would impact Ontario’s Indigenous workers and families can be found here. Calculations on who would benefit from a raise in Toronto and Hamilton are also available. Trish Hennessy is director of the Canadian Centre for Policy Alternatives’ Ontario office. Follow Trish on Twitter: @trishhennessy.